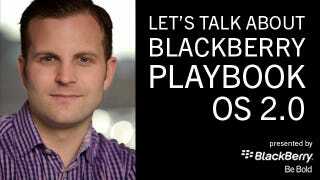 Jeff Gadway, senior marketing manager for BlackBerry is stopping by this Thursday, March 1, to answer all of your questions about the BlackBerry® PlayBook™ OS 2.0. So here's the deal: we want your questions. Send them to chat@gizmodo.com. When the post goes live at noon EST on Thursday, Jeff will be answering the best questions (a.k.a., the most intelligent and/or interesting). Come back and watch the magic unfold, live!